Today I’m talking about two big reds that are a little more expensive than what I usually highlight. In California, you’re just as likely to have a spicy Mexican recado on your brisket as you are a sweet and tangy southern barbecue sauce. At times, I’ll admit, a cold beer or ale goes a long way with the Mexican flavors. But a big, bold red wine is almost always good. This is a wine drinker’s wine. By which I mean, it’s not an easy sipping wine unless you REALLY like complex wines. Which I do. You want to serve this wine with the meal, and preferably before your guests have imbibed too much. With it’s deep garnet color, smoky rich scent, and a vibrant taste it’s a wine that deserves attention. It will stand up to almost anything you toss on the barbecue. Or, if you’re like me and want to give cooking a pass, you can serve it with rich cheeses and crackers and some salume as you watch the stars come out while having a summer picnic. Just because it’s summer doesn’t mean you can’t drink a big wine! My Rating: ~ Very, VERY Drinkable ~ though pricy! Watch for sales at your favorite grocery store. 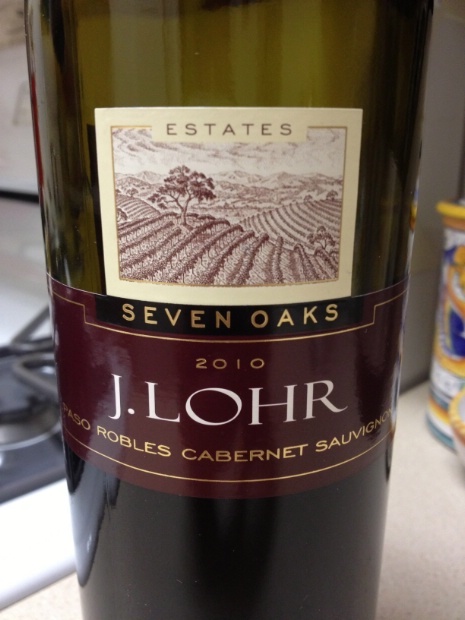 J. Lohr Paso Robles Cabernet Sauvignon 2010 Seven Oaks Estates, alcohol 13.5% by Volume $12.99 at Vons on sale. On the Label: “Our Seven Oaks Cabernet is grown in our vineyards in the Estrella Hills area of Paso Robles, one of only three appellations in California that produce “world class” Cabernet Sauvignon. The Seven Oaks Cabernet has aromas and bouquets of cherry blueberry, violets, and vanilla. The flavors are lusciously full, balanced by firm tannins. Serve it at 65 to 68 degrees F with grilled or roasted red meats. My Take: My husband and I have a fondness for the J. Lohr label, as it was one of the first, affordable, bottles of wine that we remember ordering in a restaurant that wasn’t a half carafe of the house wine. Now of course, J.Lohr is up there in price in restaurants, but you can usually find it in the grocery stores for between $10 and $15 a bottle (which puts it out of my usual price range). The wine? Juicy. Rich. A hint of oak. Perfect with a nice steak, grilled chicken, vegetables. If there’s any left after the meal, enjoy with a chocolate truffle. Your mouth will thank you. This is an easy wine to drink, and will likely appeal to a broader spectrum of people. I enjoyed it, but for me, this isn’t my first go-to wine. My Rating: ~ Very Drinkable ~ A good bottle for that intimate barbecue. This entry was posted in Wine Friday and tagged Cabernet Sauvignon, Christine Ashworth, J. Lohr, Kendall-Jackson, Wine Fridays, wine with barbecue. Bookmark the permalink. One Response to It’s Barbecue Season!